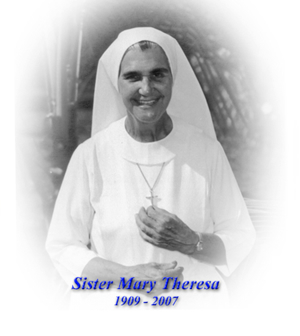 The Marist Missionary Sisters celebrate the Life and Ministry of Sr. Mary Theresa Cartier who died at Maristhill Nursing Home in Waltham, on February 8, 2007 after a long illness. Sister was born in Holyoke, MA, the daughter of Omer Cartier and Rose Anna Heault. She had two sisters, Lillian Murray who presently lives in Chicopee, MA, and Estelle Tisdell who predeceased her. When Sister Mary Theresa graduated from Grammar School she had to go to work in a Cotton Mill to help support her family. At age twenty when she was no longer needed at home she decided she would like to be a missionary to work with the poor in a developing country. Through the Marist parish where she worshipped she was put in touch with the Third Order Regular of Mary in Boston. She entered there in 1929 and made her postulancy. After six months in Boston she left for France to make her novitiate. She was professed on September 8, 1931 and received her mission assignment to the South Solomons. Later that year the Third Order Regular of Mary received approbation from Rome and received the name Missionary Sisters of the Society of Mary. Sister traveled to her destination by Cargo Ship. Her first stopover was Sydney, Australia where she worked a year before continuing her trip to the South Solomons. Teachers and nurses were needed in her new mission. Sister was not qualified for either but with study and resourcefulness she was granted a Teacher’s Certificate and Nursing Certificate by the British Government. In 1942 World War II shattered the peaceful existence of the Islands of the Pacific, and in particular, Guadalcanal in the Solomon Islands. All foreigners on the island had been asked to leave but the sisters and priests had decided to stay with their people. When the Japanese landed they took control of the government. They also took over the Mission Station, including its food and supplies, and set it up as their headquarters. The sisters moved into the jungle and with the help of natives built a bamboo hut as a hideout. When the Americans arrived on the island the Japanese set out to find the missionaries. They ordered a teenage native to find them. The boy zigzagged through the tall grass, trying to confuse them. When the Japanese realized what the boy was doing, they shot him fatally in the head. When news of the shooting reached the hideout, the missionaries decided to leave immediately. 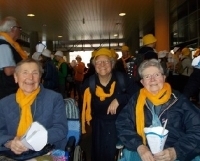 Sister Mary Theresa and three other sisters began a 35- mile journey through the jungle to Tangarare. They were accompanied by natives who knew the way. When they had to walk along sections of beach the natives walked behind them to conceal their footsteps. From Tangarare they were evacuated by the US Marines to New Caledonia on an American Navy Ship. Here Sister met many other Marines who were serving in the area. This was the beginning of a binding between Sister Theresa and the US Marines as they shared war stories. Sister spent several months in New Caledonia where she worked in nursing at the hospital, Clinique Magnin. In 1943 she was assigned to Fiji to help with nursing the patients at a leprosarium in Makogai. 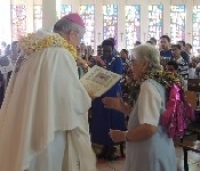 Finally in 1945 Sister was able to return to the Solomon Islands where she had taught in the school and did nursing in the clinics and at the Government Leprosarium at Tetere, Guadalcanal. 1983, at age 83 Sister returned to Waltham, MA for health reasons. 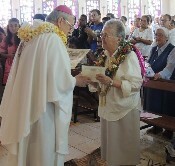 She had spent 52 years in the missions but she was not ready to retire. She got her driver’s license so she could drive the sisters to medical appointments. When her US Marine friends found out that she was back in the United States she was invited to attend the War Veterans Reunions in different parts of the country, to share her experiences of the war on Guadalcanal. In March 2005, as Sister needed more medical supervision she moved to Marillac Residence in Wellesley. She loved her stay there and was able to take part in most activities with the help of her motorized chair. In June 2006 she celebrated her 75th anniversary of profession but because of ill health she was unable to attend the celebration. That same month she was admitted to Maristhill Nursing Home in Waltham because she was in need of 24-hour care. 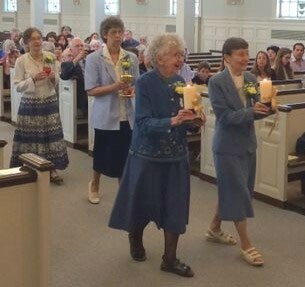 As she became weaker sisters stayed with her around the clock and on February 8 2007 Sister Jeanne Perrault was with her during her final hours. Sister was conscious until the end and able to join Sister Jeanne in saying the rosary. 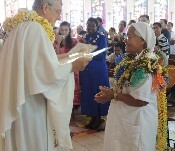 Sister Therese Douilliard, who was also a resident at Maristhill, and had worked in the Solomons, was also there to comfort her in her final moments. The sisters were called and many gathered around her bedside for a final farewell. 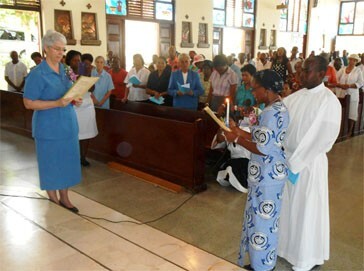 A Mass of Resurrection was held at the Marist Missionary Sisters Convent at 62 Newton Street on February 12, 2007 at 10.00 am. Burial followed at St Patrick’s Cemetery in Watertown.